As in all small towns situated in a farming community, the grain elevators were chief among the early industries. The largest was one of many owned by E. R. Ulrich and sons of Springfield, which was later sold to the Mansfield Ford Company. At the east end of town was the storage house of Mr. Aaron C. Ford. As a side line to the grain business Mr. Ulrich sold a fuel product consisting of a mixture of cobs and rosin which was packed into boxes of uniform size to be marketed. East of the Ulrich elevator were the stockyards. Cattle, hogs, and sheep were herded into town through the streets to be penned in until loaded upon freight cars bound for the city markets. 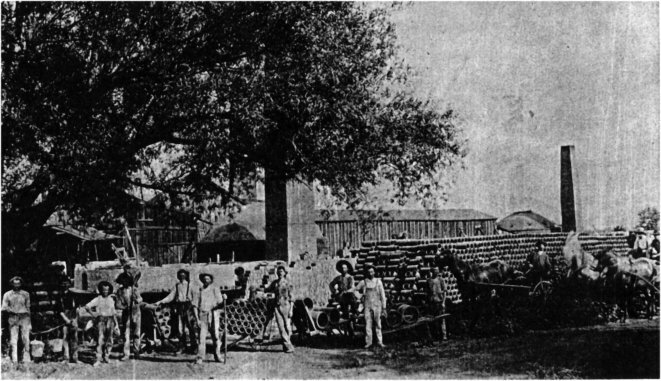 A good grade of clay being found at the eastern edge of town, H. M. Baldridge excavated a pit and founded a brick and tile yard in 1877, which continued as a thriv­ing business for many years. In times past the pond at this location froze deep enough for safe skating and is now one of the town's most scenic spots. In addition to these industries were the Dake lumber yard, D. B. Scully's Saddle and Harness Shop, B. H. Ken­dall and Sons' livery stable, two sorghum factories, the H. P. Hampton Shoe Repair Shop and a broom factory. Of these industries, only the grain elevators and lumberyard have continued to operate and expand the scope of their business. However, as we begin the making of a new century of history the importance of the town as an industrial as well as an agricultural center is evident and seems assured for the future. The several industries within the town and the five large plants, now well estab­lished on the land released by the United 'States government after World War II, manufacture products which illustrate the progress that has been made by modern science.